Prometheus; Cave of the alien – a new Discovery near Toronto, originally uploaded by Mic2006. On the surface it was sweltering and buggy, but in the dolostone rock beneath the water was icy cold and I was plagued by a constant drip, drip, dripping that frequently found my eye. Jeff, Greg and I had returned to the cave that we had recently found to do some digging and hopefully expose a tunnel that we thought must exist somewhere beneath the choke of branches and leaves. We were absolutely stunned by what we found in about two hours of digging – mind you my thighs and back are paying for it now. In front of us the tunnel wall fell away and beneath we could see a passage. Although the tunnel is tight we theorize that this might be a feeder tunnel as the scallop orientation suggests that possibility and also the size of the in-flowing stream also leads us to suspect that we are yet to make the most significant discovery. Some might ask, “What is an extreme sport?” and in answer I would probably suggest that they are usually outdoor activities that entail some measure of risk. The greater the risk, the more extreme the sport. Some of the better known examples of extreme sports would be half pipe skiing, street luge, and bungi jumping. The most widely acknowledged of the most extreme sports are those that are the most visually impressive, or those that have the apparently most spectacular of consequences. 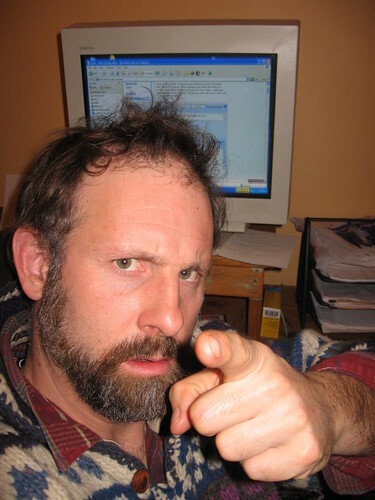 You might also suggest that popularity is sometimes accelerated where there is an element of competition. It is competition that is most successfully marketed on television. It’s not hard to classify base jumping into the list of most extreme sports, firstly, a base jump gone wrong is stunning in a ghoulish kind of way; it’s often a mistake that is captured on video in a very public place – an unexpected thump, shrieks of horror from admiring fans and limbs and body parts scattered over the impact zone. It’s all part of the culture, oddball activities with lots of risk – preferably in places where everyone can see. Extreme sports enthusiasts say they don’t care about the established culture, life is too sanitized, “They want to feel alive”. It is this feeling of risk in extreme sports, that is appealing to both participants and spectators alike. The extent to which the counter cultural element defines extreme sports is debatable. And in this age of sponsorship and marketing it would appear that an extreme sport defines a lifestyle, or visa versa. In line with that mentality, there are huge marketing campaigns that follow certain of the better publicized events, and products that follow from the lifestyle, or supposedly define the lifestyle. Many a snowboarder might feel that they were unable to perform without the appropriate Gortex gear and withoput a Ripcurl wet suit how could a surfer possibly even get upright on their surf board? Red Bull, an energy drink, is a huge sponsor of extreme sporting events and ginseng and guarana often find their way into essential extreme sporting rehydration and energy potions, and don’t forget electrolytes. Check out Fan Scootering here, it would appear that the people who posted this on you tube are also asking the question of, What is an extreme sport? In answer, it certainly goes against the grain, but speed bumps might more clearly move fan scootering into the realm of an extreme sport and bell bottoms would add to the danger but look pretty neat blowing out behind a scooterist. (just kidding, but I think they have to re-consider their possible inclusion X Games) – No red Bull powers these guys, possibly diet coke or lemonade (nothing wrong with that). Though extreme sports athletes once existed in their isolated spheres of endeavor, with only small followings of like-minded enthusiasts to applaud their daring, in the mid 90’s the extreme games concept was pitched by ESPN and now, what started as a risky proposition (appropriate I know) now appears as the X Games with a television audience of over 44 million. In the extreme sports world, “the reward is in proportion to the risk”. In 2002, there was supposedly 1 fatality for every 60 base jumpers. Wing suiting seems to receive growing exposure amongst extreme sports groupies and the horrific death of one of the sport’s greatest athletes was captured on video when he hit a bridge while trying to fly under it and now the video can be seen on youtube. Far from dissuading potential participants, spectacular demise only encourages the subculture of people who flock to the most extreme sports of all. Caving is an extreme sport. It has its own odd subculture and stars who are known locally by other serious participants. But caving is unlikely to develop the mass following of adrenaline junkies and arm-chair sporters. 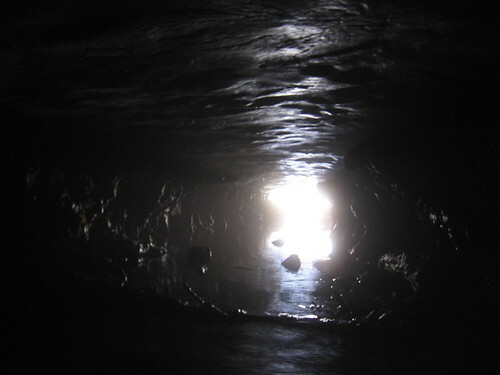 Visually, caving takes place in utter darkness, an absence of light that is so absolute that the caver’s headlamp is possibly the first light that has ever been cast upon the tunnel – such remoteness and darkness is not necessarily conducive to television. It’s unlikely that you could ever film some places that the most extreme cavers have crawled into. 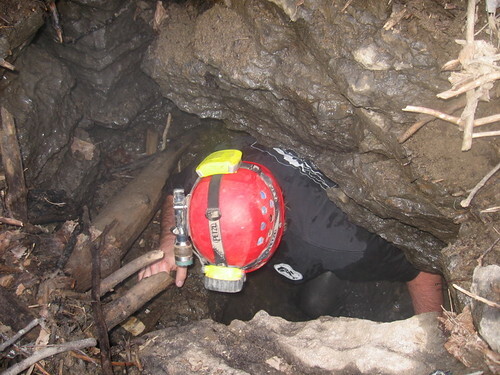 Cavers are exposed to a variety of risks, but to live long and accident free a caver has only to manage the risk. 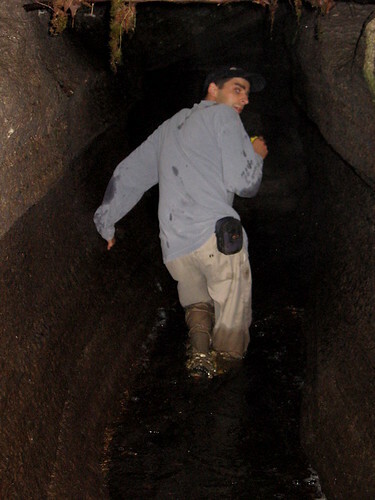 Cave diving is an example of the management process. Some say that cave diving is the most dangerous sport in the world. Others argue that it is generally those who do not follow the accepted procedures that die. In Canada, there is no cave dive that is within the rules and limitations of basic cave dive training. Cave diving in Canada tops the list of the most extreme sports in the world, but as a marketable sporting event it still sits back in the shadow. 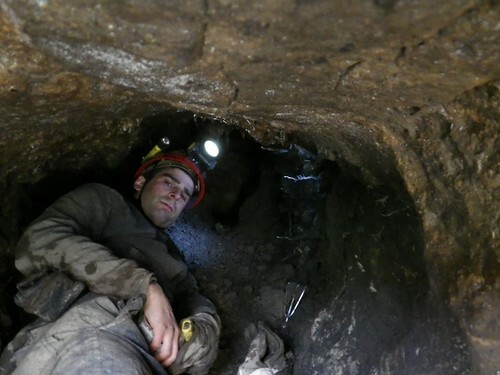 In my recently published book, ‘Caving in Ontario; Exploring Buried Karst’ I write of this most extreme of activities, a sport that might top the list of most extreme sports. Few will see a caver in the pursuit of virgin passage exploration and yet in Ontario, it is an activity that happens several times a year. Like half-pipe skiing, caving can also be a winter sport, a wetsuit and lack of bodily feeling makes caving in the winter a distinct reality. Some of Ontario’s wild caves have been explored in temperatures that are well below freezing – in fact I’m considering a trip into extreme winter sports next weekend (not a cave with bats – there are certain ethics that must be followed). Any takers for a sponsor? Maybe Cadbury’s hot chocolate? Anyway, if you are into caving or exploring you might find that my book ‘Caving in Ontario’ tells you something of an adventure that takes place beneath your feet where you had never thought to look for thrills. Who says that an extreme sport has to be screaming adrenaline and energy drinks? Caving is measured, paced, logical and tenacious where you might wriggle for hours through freezing mud to reach a place where no other human has ever gone. And to add to the perversity of the situation, you can do this within a short few hour’s drive of Toronto (or less). Caving is an extreme sport without the public spectacle and cheers of admiring fans. IMG_8539, originally uploaded by Mic2006. As my son said – looks like some kind of science fiction scene – well in a sense it feels that way as well. today I am on the hunt for a new wetsuit to accommodate the needed exploration. I guess I’ve been bitten by the caving bug again. Here’s my plan – video this first time exploration, I mean there’s something to be said for exploration in southern Ontario where you’d expect that everyone’s been before -but not here. 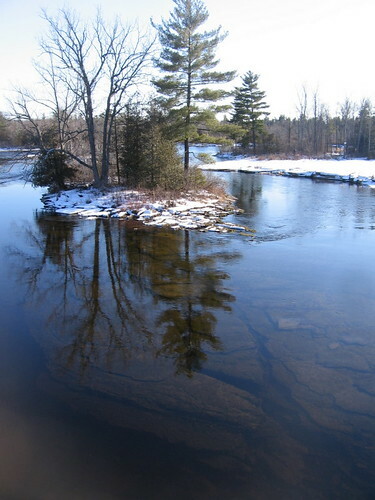 the geography of southern Ontario remains unexplored in certain special places. This photo was taken with some difficulty with my little hand-held canon (no flash). Next trip I’ll have video. It is so odd that there is this karst geography in southern Ontario and people living close by and nobody knowing a thing about it – nobody knows about the underground tunnels beneath their farm or house, or nobody cares – WOW, get off your sofa and have a look!